On this 6-day tour of Rwanda and Uganda you will have the opportunity to experience ancient Batwa culture, climb a volcano, track golden monkeys, and track the majestic mountain gorillas in either Uganda, Rwanda – or both! This safari starts and finishes in Kigali, the capital of Rwanda, from where were you will drive to Mount Gahinga Lodge nestled in the Uganda foothills of the Virunga Volcanoes. After two nights at Mount Gahinga Lodge, you set off for the magnificent Virunga Lodge, just across the border in Rwanda, which is perched high on a ridge and has stunning views of the volcanoes and the twin lakes Bulera and Ruhonda. Arriving in Kigali you will be welcomed by your expert guide who will provide knowledge and assistance throughout your safari. Set off for the Volcanoes Mount Gahinga Lodge and cross the border into Uganda. Enjoy your pre-dinner drinks on the terrace with stunning views of the Volcanoes or warm yourself inside by the roaring fire. Please book flights arriving no later than 10:00am. Visit the Gahinga Batwa Village, experience the culture and history of one of Africa’s oldest tribes. On your tour, you will visit their new home and will participate to the Batwa Heritage Tour to gain insight into their traditional life in the forest and even have lessons in hunting and gathering of medicinal plants. Other exciting activities for those interested in the culture and natural history of Mgahinga include hiking the Muhavura, Sabinyo or Gahinga volcanoes, enjoying the Batwa Dance Group perform, visiting the Batwa Vocational Center, and tracking gorillas in Mgahinga Gorilla National Park. NOTE: One Rwandan gorilla permit is included in the cost of this safari. To track gorillas in Mgahinga, additional permits are required. A relaxed morning during which you will be accompanied by a ranger to track the golden monkeys through the bamboo forests of the mountains. Return to the lodge and after lunch drive across the border into Rwanda. The magnificent Volcanoes Virunga Lodge is perched on the top of a hill with 360° panoramic views of the chain of volcanoes and Lakes Bulera and Ruhondo. From the terrace you can take in the sunset over the lakes and – weather permitting – enjoy an exhilarating performance from the colourful Intore Dance troupe that showcases the unique Rwandese culture. It is an early start for gorilla tracking in Parc National des Volcans, through the enchanting bamboo forest on the slopes of the Virunga range of volcanoes. After a gentle climb of between one and three hours, you will spend one hour in the company of these gentle apes before returning to base in time for a late lunch. Some gorilla families can be more elusive, and tracking can take a full day, especially if it is wet and muddy. Trek to the grave of pioneer primatologist Dian Fossey and visit the gorilla cemetery, the final resting place of her favorite gorilla, Digit, and many other gorillas. Visit Lake Kivu, location of the finest inland beaches in Africa. Take a guided walk to Lake Bulera, to experience village life. Tour the former Imbabazi Orphanage and beautiful English cottage gardens. Drive to Kigali, and time permitting, enjoy a city tour and a visit to the Kigali Genocide Memorial before your international flight. A visit to the Kigali Genocide Memorial is a moving testimony to this country’s past that it has courageously overcome (guests to pay/donate entrance fees directly). Transfer to the airport in time for your return flight. The magnificent Virunga Lodge is perched high on a ridge and has stunning views of the Virunga Volcanoes and the twin lakes Bulera and Ruhonda. 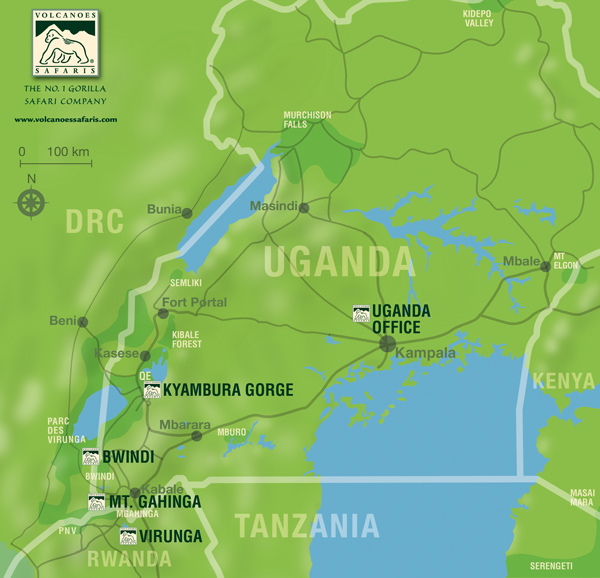 The premier luxury destination for tracking the endangered mountain gorillas. Nestled in the foothills of the Virunga Volcanoes, Mount Gahinga Lodge is an exclusive lodge that has the impressive backdrop of three of the volcanoes themselves. Its rustic charm creates an absorbing atmosphere of tranquility and history.